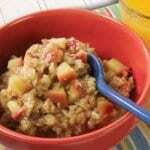 Oatmeal with Apples | JPMA, Inc.
A delicious recipe with nutritious ingredients. In a medium-sized microwave mixing bowl, mix all the ingredients. Place the container without lid in the microwave oven and cook at high temperature for approximately 2 minutes. Stir and let it cool for 1 minute before serving.